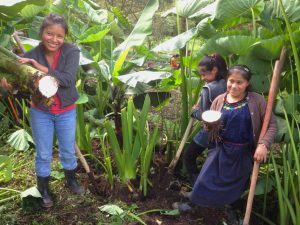 CCFC’s mission is to end poverty through education and improving agriculture in the tiny villages that surround the remaining cloud forests and cloud forest fragments. As farmers diversify their crops, CCFC can play an important role in linking farmers to the market place through direct market access. CCFC works with plum growers from the very highest villages. Linking these farmers to local and distant markets can help farmers get established with new crops such as plums. Farmers linking hands with consumers. CCFC provides direct market access to farmers. Plum production in full swing. One farmer from the cloud forest village of Sebob harvested 800 pounds of plums from one tree in one season. Not only does Cloud Forest Products focus on direct market access, CCFC sees a huge potential for economic self sufficiency for its educational programs through on-site value adding. WALC students learn to make jam and fruit roll ups from plums and other products from cloud forest bordering villages such as wax, fibers, spices and other raw materials. In learning to do these production techniques, students are adding value to these raw materials. Someday, WALC students will be able to fund their own scholarships through the work of adding value to products that come from the cloud forest region. CCFC interns from the local natural resources school experimenting in canning fruit. Peaches and peach jam. A great example of adding value to product. WALC students add value to naranjilla fruit by making jam. If a batch of jam doesn’t set up, it makes a great fruit drink concentrate and is enjoyed by WALC students during the 25 day workshop. Naranjilla jam that does set up is sold through CCFC. Kids & Birds students make fruit drink from the naranjilla fruit. In 2015 and 2016 Kids & Birds students took naranjilla seeds back to their schools and established seed beds for propagation thus multiplying the gift. This is CCFC’s friend Vicente and his devastating deforestation. Vicente is a subsistence farmer. He grows corn and eats it. He has no income from his corn crops, just corn and beans. Several years ago, Vicente started to harvest berries from the a cloud forest tree related to the bayberry. This is Vicente with one of the trees that he harvests for the candle wax. This is Vicente selling his candle wax. Cloud Forest Product: candle wax from a species of small tree in the same genus as the bayberry. Vicente of San Antonio de las Puertas sells this product to CCFC. Vicente is paid a fair trade price through direct market access. Since this is an alternative crop for Vicente it is a step toward crop diversification and income generation. Vicente and the cloud forest are both better off for it. WALC students learn to make candles. This value adding translates into income directly to the WALC program making it possible for WALC to provide these young women with scholarships to continue on in school. WALC supporters buy these cloud forest candles. Vicente gets is fair trade price on his wax. WALC students get to learn to make candles and receive a scholarship. WALC supporters are happy to have access to candles of such quality and story. For a new idea to take hold and for a new practice to be sustainable it has to be economically viable. If farmers can make money using a new technique, that technique has a better chance of catching on. (It’s not a guarantee of success however.) The logic behind Cloud Forest Products is create the direct market access link. Cloud Forest Products provides farmers in remote, rural villages direct access to markets. This gives a chance for new crops to get established both in production and in the market place. The logic behind On-site Value Adding is to both create an educational and productive activity for students that is applicable in their village context and to make CCFC’s programs more financially self-sufficient.